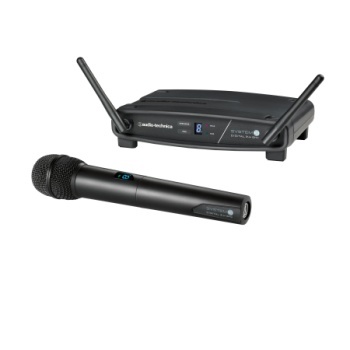 This high-fidelity digital wireless system (2.4 GHz range) offers advanced 24-bit operation, easy setup and clear, natural sound quality for musicians and presenters. Provides three levels of diversity assurance: frequency, time, and space. Up to eight channels may be used together without any frequency coordination problems or group selection issues. System includ an ATW-R1100 receiver and ATW-T1002 handheld dynamic unidirectional microphone/transmitter. Includes AT8456a Quiet-Flex™ stand clamp.